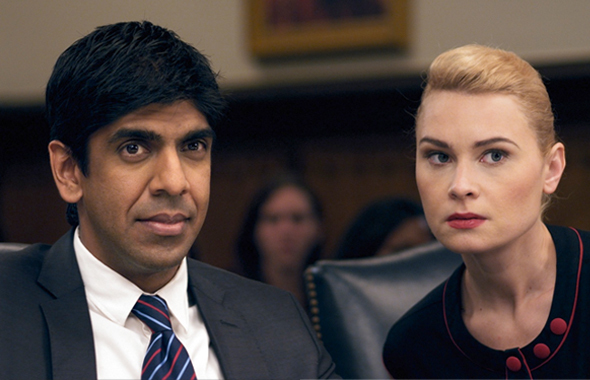 Ray Shekar (Sachin Mehta) with Allyson Daugherty (Kristina Klebe) in the courtroom in the newly release indie movie The Advocate which will premier in the Dances With Films festival in Hollywood on Saturday, June 8. LOS ANGELES: Revealing the central element would not be giving away too much of the plot of The Advocate, the new indie movie that will have its premier next week on Saturday, June 8 at the Chinese Theatre in Hollywood. The film has many more twists that will keep you riveted till the end, just when you thought it was all over. The plot revolves around an attorney who has had his fill of practicing criminal law a few years after he finds his wife killed in the beautiful hillside home with a pool that he bought to surprise her with. While his office is being remodeled, the attorney, Ray Shekar (Sachin Mehta) temporarily moves his work and staff to this home. But a spate of unsolved murders of the clients that he defends puts him in the cross hairs of the eagle-eyed Los Angeles Detective Perkins (Michael Raynor) and his rookie partner Detective Teller (Dalia Phillips). Steffinnie plays Julia, Ray’s law partner. While contemplating a change to civil law, Ray is sought out by the young and beautiful wife, Allyson Daugherty (Kristina Klebe), of a rich, unscrupulous businessman. She is caught with bloodied hands near a blood-soaked mattress on a yacht off the California shoreline by the Coast Guard. They suspect she killed her husband, but the body is never found and, facing a death sentence, she pleads with Ray to take her case. He takes the case though his law partner Julia (Steffinnie Phrommany) is skeptical of Allyson’s story, especially as mounting evidence shows her in a bad light. The rest of the story develops as Ray shows how he is able to unravel the strands of clues to defend Allyson, while getting romantically involved with her. The rest of the story has you guessing her fate, and the twists – three of them in the final seven minutes – will certainly surprise you. For Sachin Mehta, the legal jargon and maneuverings were all too familiar aspects of the cases he had to fight as a public defender in Los Angeles, though now his practice mostly deals with civil litigation, contracts and intellectual property. This is his first attempt at production full-length feature film, and he admits that some of the elements of the cases he has fought have rubbed off into the onscreen scenes. The movie was written by Tamas Harangi, a Hungarian who came to the US ten years ago, but Mehta consulted with him on the legal elements. “But it was Tamas who came up with the plot line and the twists in the story,” said Mehta in a telephone interview. “Tamas was fascinated by the concept of ‘mock juries’ and that’s how the story line started.” A mock jury via camera on a television screen features prominently in the movie as Ray ponders his next moves. The film was shot entirely in the Los Angeles area, with many scenes indoors in the house and the courtroom scenes in a studio, with cinematography by John Honore. The released version has a well-scrubbed feel to it that’s often hard to find in first-release movies, and Mehta attributes that to the painstaking editing that David Abramson did with Harangi to get the cuts between scenes and the flow of the story just right, the original musical score by Frederik Wiedmann and the opening and closing graphics, often overlooked in tight-budget movies. The cinematography is also very crisp, although a few of the outdoor scenes are grainy, but the focus is on the development of the characters, especially that of the main protagonist, Ray Shekar who is The Advocate. He is ably supported by the rest of the cast, who are comfortable with their roles – Phrommany as the quick thinking Julia who guides Ray along the right path; Klebe as the pretty but disturbed Allyson; Cardiff as the mysterious investigator with a dubious past and Raynor as the detective eager for a collar – and the results are great for a first effort. So much so that The Advocate won the Audience and Jurors Awards at the Durango Film Festival this March. It is an official entry at the Dances With Films festival that has its red carpet opening this coming Thursday, May 30 at the Chinese Theatre, followed by its premier on June 8. Mehta already has his sights set on the AM/FM Film Festival in Palm Springs on June 15 and a few more festivals on the way, he hopes, to better distribution channels. Mehta’s late blooming passion for film making and acting has caught on with other members of his extended family who have supported him, especially Nalin Shah, of Mumbai who came onboard with financial support as the Executive Producer. “I can’t thank him enough,” said Mehta, who co-produced the movie with Harangi. Mathew Temple, Adam Herring and Andrew Hayes. Born and raised in Hollywood, Mehta still visits Mumbai (“I’ve made 13 trips,” he chuckled) where his parents came from in the ‘70s, though he speaks only some Gujarati and little Hindi. He finished college at USC in Los Angeles, where he also continued on to Law School. “This film was a huge learning curve for all of us,” he explained, “but we have a great team and would like to work together again.” Mehta and Harangi are already working on new scripts and “in a year or so, we hope to make another movie,” he added.